As a huge fan of cartoons and of Netflix, I was excited and happy to learn that DreamWorks' Turbo FAST starts streaming on Dec. 24th. 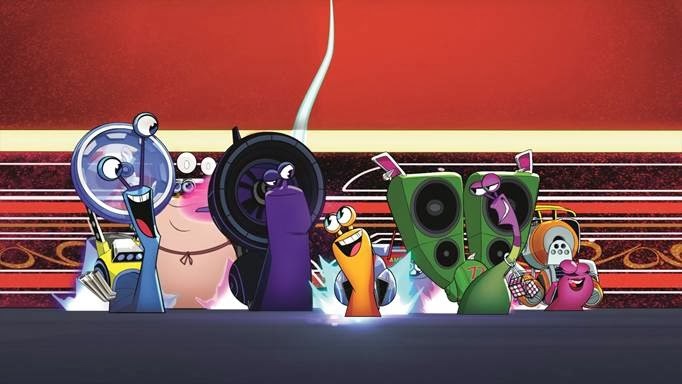 The first-ever Netflix original series for kids, Turbo FAST is a high-octane ensemble comedy that amps everything up to the extreme as Turbo and his adrenaline-fueled crew go on daring new adventures, race on the coolest tracks, and take on the craziest challengers. Stunt Team members -- Turbo, Whiplash, Burn, Smoove Move, White Shadow, Skidmark and Chet-- already have legions of fans from their appearance in the DreamWorks Animation’s feature film Turbo, which opened in theatres around the globe earlier this year and has already grossed more than $280 million. 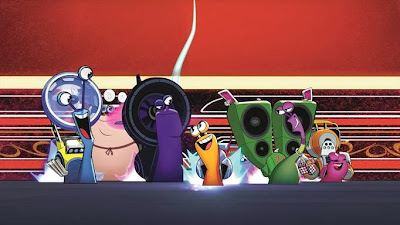 The all new television show digs deeper into the crazy personalities of the snail crew and features 2D design to create a stylized look reflective of the Stunt Team’s fast-paced, souped-up world. My family had the opportunity to screen the first two episodes - and they are awesome! Kids will love the entertaining, action-packed, potty humour-filled plot lines while parents will appreciate the "inside" jokes and awesome soundtrack. Part of our Christmas Eve plans definitely include watching the next three episodes, and then we will have to patiently wait for more to be released throughout the year. To celebrate the launch of Turbo FAST, one lucky YYZ Bambina reader will with a 6-month Netflix Canada subscription AND a party watching kit! Open to Canadian Residents (excluding Quebec) who are the age of majority only. Valid entries only. Contest ends December 22, 2013. For further contest rules, refer to the Terms and Conditions within the Rafflecopter. Disclosure: I received a party watching kit and access to screeners for the purpose of this review. As always, all opinions are my own. looks like something my kids will love! and adult humour in a kids show is always a bonus! It looks like a lot of fun to watch! I think it will be busy enough to keep my daughter's attention! Just the fact that it's a nice kid-friendly option on Netflix that we haven't seen yet.. something new to break up the same old! Honestly, I like that Turbo FAST is not all pink and princessy! It seems fun as the characters will take on the craziest challengers and I think my kids would love it! Love the snails. Looks like it will be a fun show...sure to entertain. My kids loved the movie turbo and i know they will love the tv show too! the turbo movie was great and my kids loved it! I think they will enjoy the tv show too! things going fast, great animation - what's not to like? How much fun my boys will have watching it! My little guys love snails so I think they would really enjoy Turbo the tv show! I like the story line that the underdog get out there and tries! I haven't actually seen the movie, yet, but I like this animation style. I love the animation and I know my son, who is crazy for anything that goes fast, will love the show. I've loved most of Netflix's original programming so far so it will be fun to watch this with the kids!. Getting to see more adventures based on the great movie! It will entertain my kids! The animation and the story exite me about Turbo Fast. I keep hearing good reviews, which is not suprising as with all DreamWorks animated films. Such a cute and fun movie to watch. My son loves turbo. i think it would be a nice show for him! A great movie for the kids! that it is good family content! It's a movie my daughter has been goin on and on about, I've read tons on it and anxious to watch it with the family! Turbo FAST looks entertaining for the whole family. Turbo Fast is entertainment the whole family can enjoy.